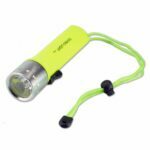 This tiny, 2.64-inch LED pocket flashlight with clip-on lanyard is designed for close-quarters use. Its tough Xenoy body is faceted for secure gripping and molded in one piece with the pocket clip so the clip is virtually unbreakable. Pushing the pocket clip activates the switch, which provides quick on/off or momentary activation. 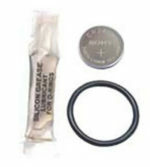 A bright white light (9.0 tested lumen value) is produced by four LR 44 1.5V alkaline coin batteries (included). 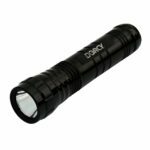 The flashlight weighs just 0.9 ounce with the batteries, which have a burn time of 130 hours. Because impact-resistant Xenoy is a blend of polyester and polycarbonate, it won’t cause sparks and is safe to use in electrical environments. Dave Parker, president of Pelican Products, has been an avid scuba diver since age 11. During his early diving years, he repeatedly discovered that something he needed to make a dive complete was simply not available. It dawned on him that if he needed that piece of gear other divers did, too. In 1976, he began the company with his wife and co-founder Arline, an airline stewardess, while he continued his advertising and industrial-design business. From that inception as a small garage operation, Pelican has blossomed into an international marketing and manufacturing firm. With a long lamp life and extended battery burn time, you won’t be left in the dark with the L1. The polycarbonate body is resistant to chemicals, water and corrosion. The convenient tail switch for constant on/momentary is easy to operate. The L1 is perfect for close quarter use. 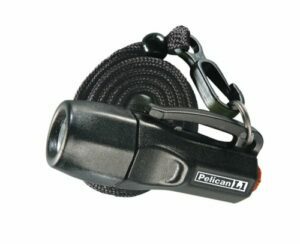 Packaged with 4 LR 44 1.5V alkaline coin cells, a break-a-way safety lanyard, and colored lens discs to preserve night vision. This handy light offers a lot for its size.